These photos may not be reproduced or downloaded with out the permission of the photographer. If you would like to purchase these images please click on the image and it will link to a page from which you can purchase the images. Last week, father and son duo, Dave and Nick venture north from their home state of Florida to Washington to climb Mt. Shuksan. Mt. 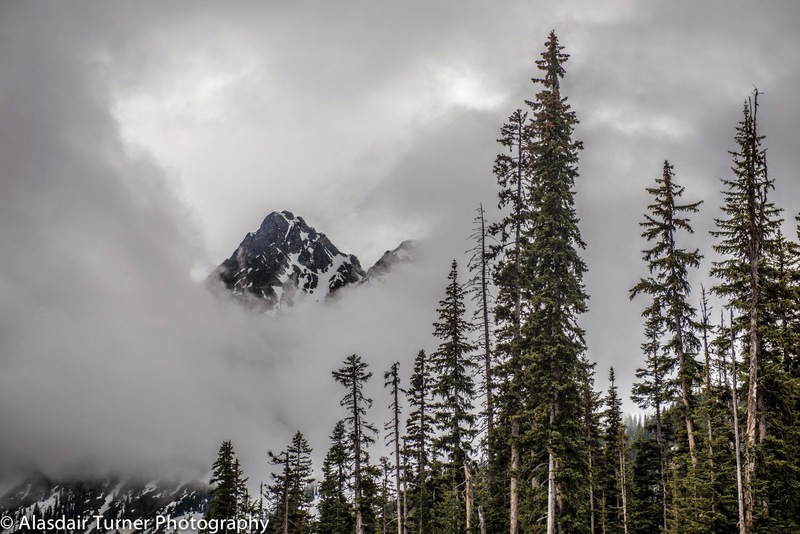 Shuksan is a glaciated massif in the North Cascades National Park, just 11 miles south of the canadian border. It offers a wide variety of routes ranging from moderate glacial travel to extremely technical lines. The majority of routes end at the base of the summit pyramid. From the base of the pyramid at 8,600 ft, it is roughly 600 ft to summit. And what a summit it is! 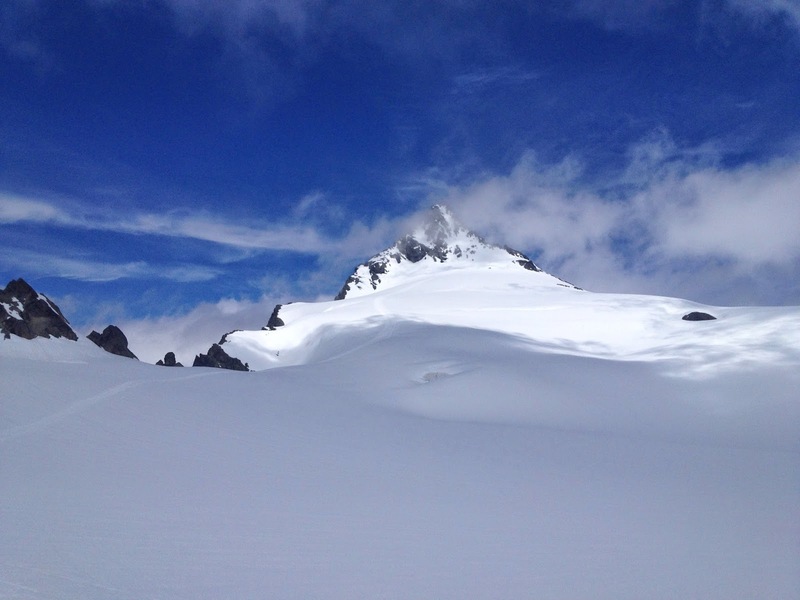 Shuksan's summit is not a massive crater or plateau like many other of the northwest peaks. It is a small, summit that only several people at a time can squeeze on to. Our route ascends the Sulphide Glacier (pictured) via mellow rollers before reaching the summit pyramid. The final 600 feet ascends the steep snow chute in the middle of the pyramid. It involves steep snow climbing and a little rock scrambling. Dave has spent many days and night on glaciers before. However this was Nick's first time on a glacier. Nick is a fit 20-year-old life guard from Florida, who had no problem adapting to the new terrain. Day 1: We began at the AAI world headquarters in Bellingham, WA. The gear check was short and sweet given Dave's experience in the mountains prior. After the gear check we purchased our last coffees and the drive began. It is roughly 78-miles to the Shuksan Trailhead and it takes about 1 hour 45 minutes. The hike up to camp was mellow. We took our time, taking breaks roughly once per hour. Planning ahead for poor weather, we opted to do our snow school training on the way to camp, as opposed to on day 2. We also chose to camp at the higher camp at 6,500 ft in order to shorten our summit day. This proved to be a great camp complete with amazing views and running water. Day 2: Typically Day 2 is our snow school and crevasse training day. However, due to weather, we rearranged the schedule slightly. We woke early at 3:00 to clear skys and colder temps. Exactly what we needed for a successful summit! We made coffee (critical) and breakfast and left camp at around 4:45. 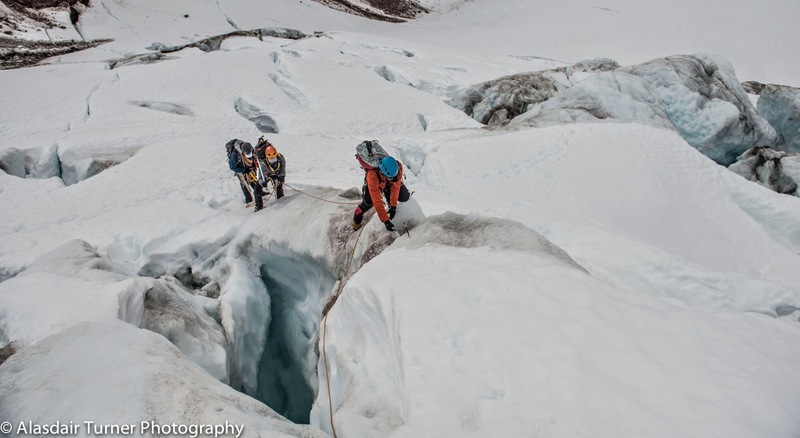 It is roughly 2,000 ft of mellow glacier walking to the base of the pyramid. We took two breaks along the way for water and food before reaching the base of the pyramid. We were above the clouds with only Mt. Baker and Shuksan visible. Light winds kept the temps cool and perfect for kicking steps and ascending the final 600-feet to the top. There are really no good resting points in the 600 feet of final climbing, so we went slow, took our time, and reached the top with no real food or water breaks. After snapping a few pictures up top with Mt. Baker in the background (pictured below) We began the descent back to the Sulphide Glacier. Dave and Nick got to enjoy several lowers down the steep snow utilizing ropes, before the terrain mellowed enough to just walk. At the base of the pyramid we took a much needed food and water break prior to heading back to camp. Nick (left) and Dave happy to be above the clouds. Mt. Baker behind them. Headed back into the clouds and down to camp after our summit. Day 3: We had made the right choice! Rain pattering on our tents woke us on day three. A summit would not have been possible. We again made coffee (critical) and had breakfast. The drizzle broke just long to pack tents and head back to the car. After 2.5 hours, we were back in flip flops and on dirt. The walk back to camp with the summit pyramid on the left. Climbing is awesome. Cookies are awesome. HUGE cookies after climbing an amazing mountain are down right incredible! Dave is PYCHED! All in all, it was a great trip. 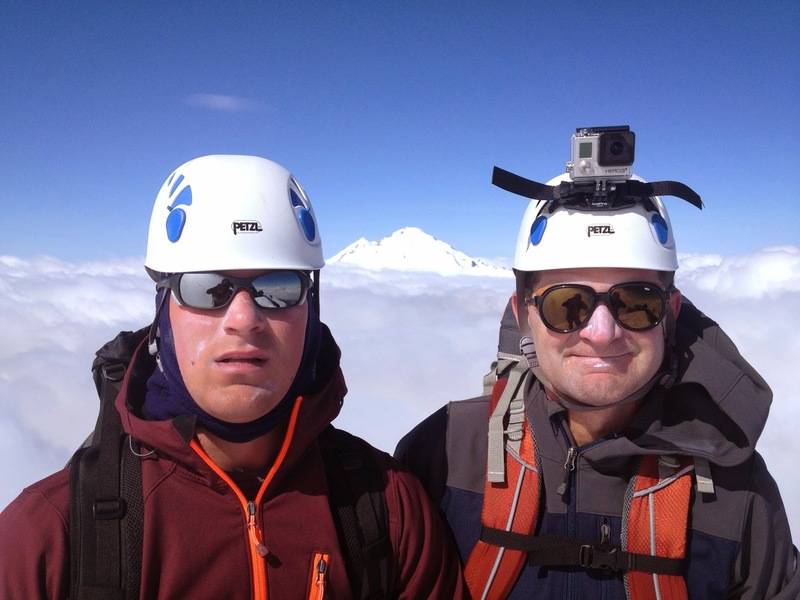 Dave got an other peak and Nick experienced his first mountain climb on a glacier! Elbrus rising up from the surrounding valley. 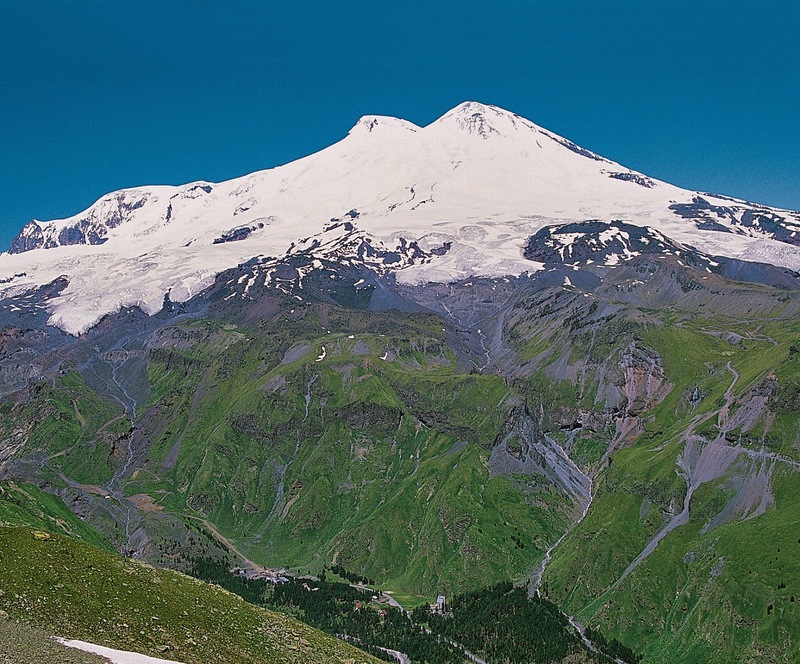 Mount Elbrus is a giant, dormant volcano which separates Europe from Asia in the Caucasus mountain range of Russia. 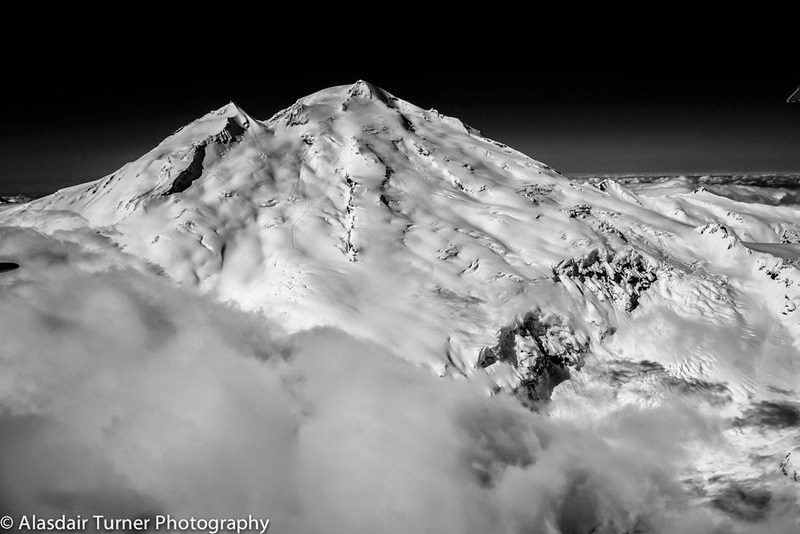 It is also one of the famous Seven Summits. While the mountain is heavily glaciated, the moderate angle of its slopes make the climb suitable for people with basic alpine skills and an interest in high altitude climbing. 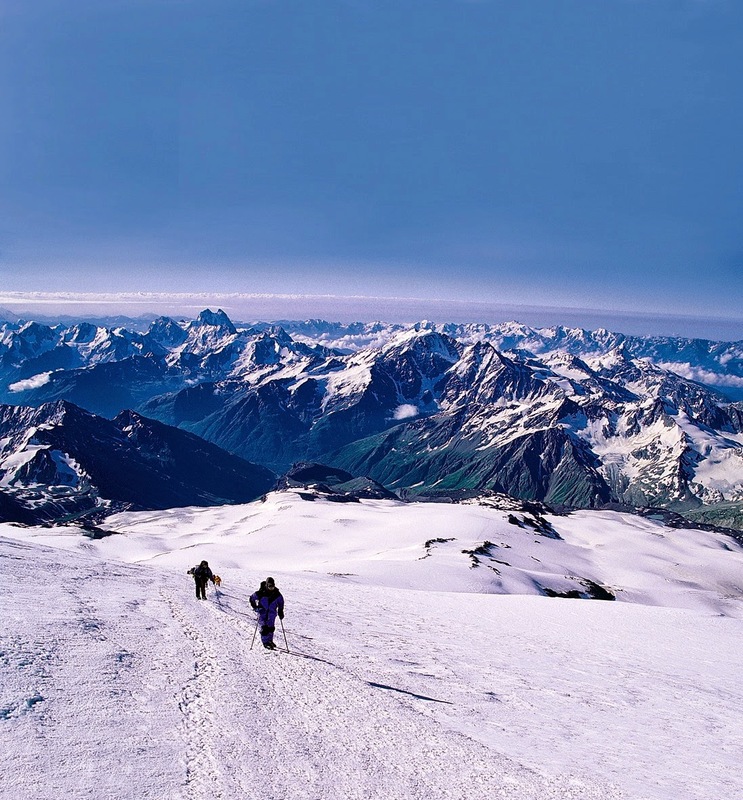 Any expedition to Elbrus will aim for an ascent of the peak and the trip can be greatly enhanced by adding short and quick side trips. In-depth looks into the cultural and architectural wonders of this ancient country will make for many great stories and photos for you to bring home. A great way to begin the trip is in St. Petersburg and then return home via Moscow with itinerary highlights that include visits to museums, art galleries and major architectural attractions. 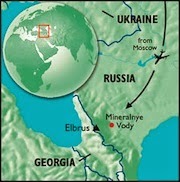 After exploring St. Petersburg, you will fly south to Mineral Vody on the edge of the Caucasus. A short drive to the beautiful tree covered valleys brings you into the mountains themselves. Based from charming hotels in the Baksan valley, the next few days are filled with acclimatization hikes, good food and pleasant surroundings to help you fully appreciate the region. After several days, you move into the high mountain huts for more training followed by the ascent itself. On the slopes of Elbrus, you will stay in barrels huts at 12,800 feet and continue to acclimate for a couple more days. As a proven ascent program, several contingency days are built into an itinerary to allow for inclement weather and assures a very high chance of success. Enjoying the sunset from Camp 1. Summit day begins before sunrise as with a climb up moderate snow slopes towards the east summit. Approaching the saddle between the east and higher west peak, you can see the remnants of a derelict hut not able to withstand the elements at this altitude. The final push brings climbers onto the summit ridge with a tremendous sight of hundreds of peaks throughout the Caucasus. Slowly turning in a full circle, you can see wooded valleys merging into mountains of rock and snow, all with early morning light glimmering off the Black Sea. 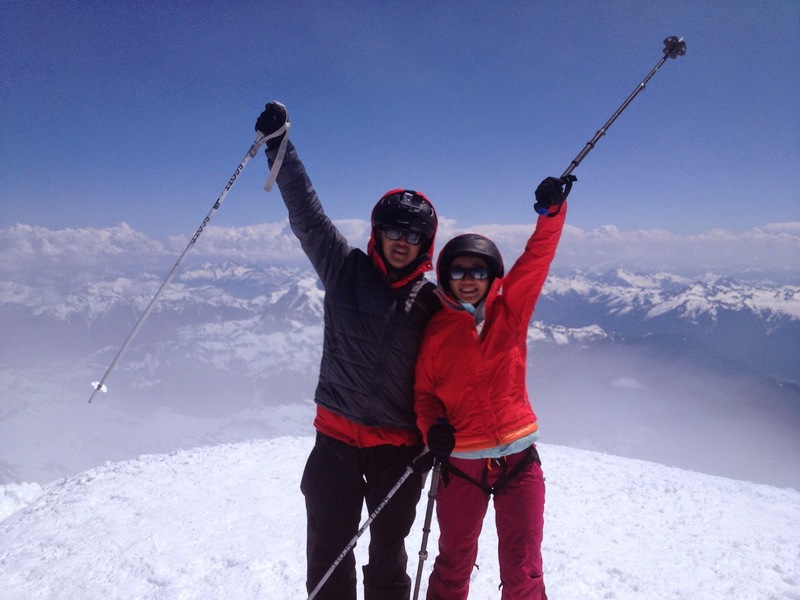 The visual rewards are well earned for reaching the highest point in Europe and for climbing one of the Seven Summits! move on the slopes of Elbrus. Staying in hotels, lodges and huts avoids the need for tents so you can simply bring along a sleeping bag and your climbing gear and enjoy the climb! 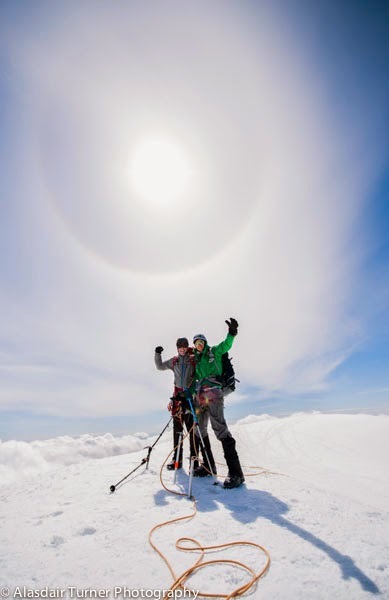 Attaining a relatively high elevation at 5633m or 18,510 feet, Elbrus certainly demands respect for its altitude and a deliberate focus on climbing high each day and sleeping low to facilitates effective acclimatization. As with any foray to high altitude, it is imperative that expedition members are fit, strong and in good health. 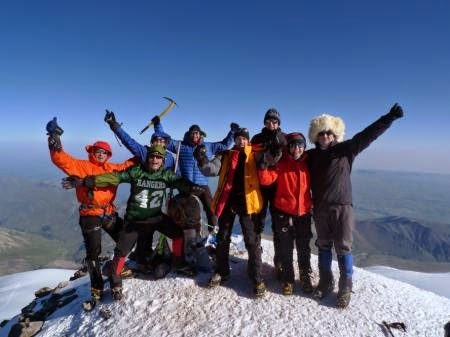 Success on reaching the highest point in Europe! Looking to add more adventure into your trip? Climbing Elbrus and Kilimanjaro in the same month is a great way to experience two of the Seven Summits. Being acclimated after the first mountain makes it much easier to make a summit attempt on the second mountain. Contact our office for more details! See y'all in the mountains soon! 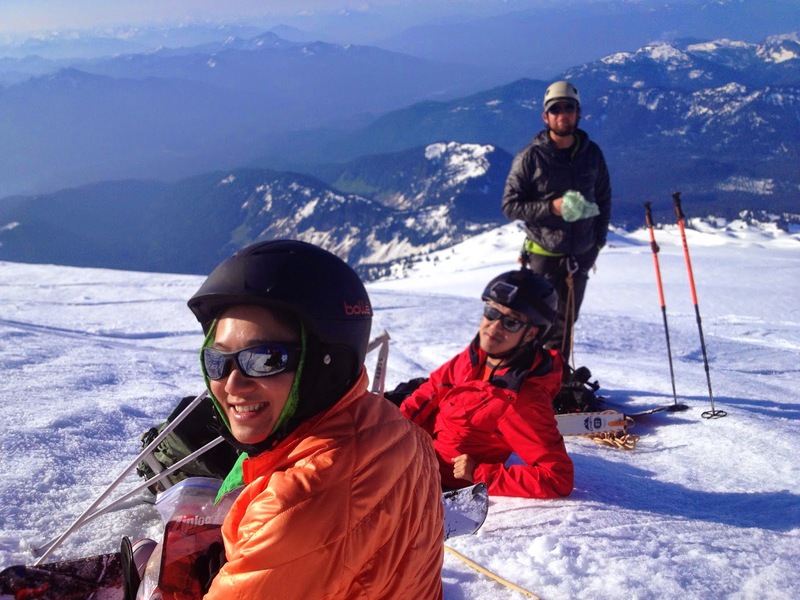 I just spent 3 days on the north side of Mount Baker doing a basic skills and summit climb. 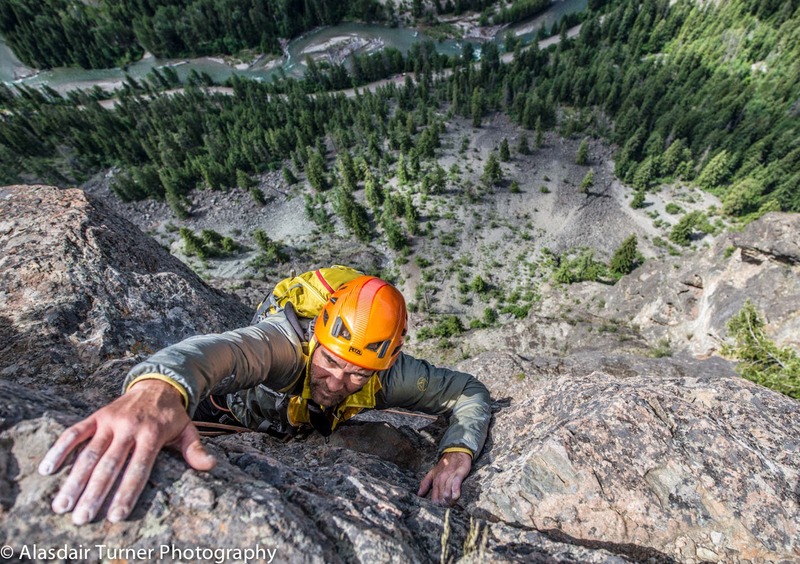 This is a course offered by American Alpine Institute. More information on the course can be found at their website here. Due to a questionable weather report for the summit day (typically the third morning) we decided to climb on day 2. We got quite a late start for the summit but given that the evening temperatures have not been dropping below freezing and generally good glacier conditions this did not make much of a difference. This was my first summit of the season and it was nice to stand atop the mountain I have summited more than any other once again. 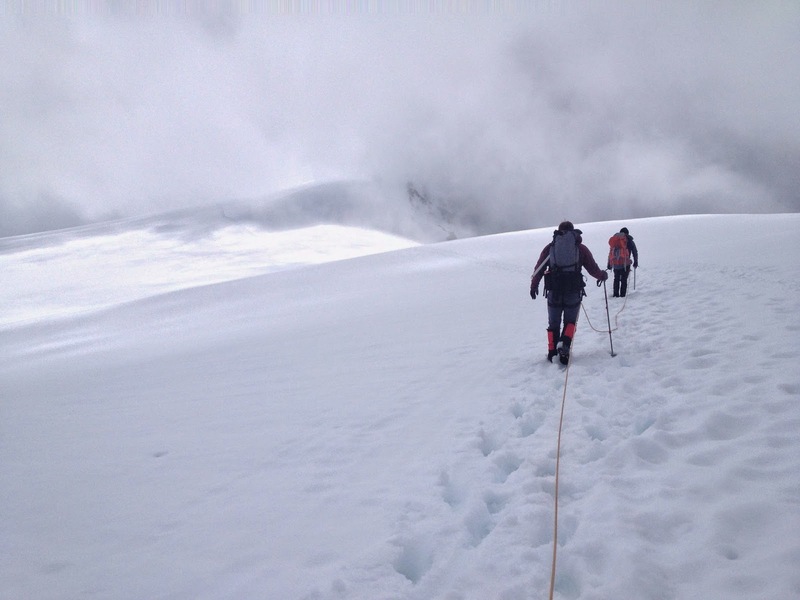 I just recently returned from a 12 day Alpine Mountaineering and Technical Leadership course. 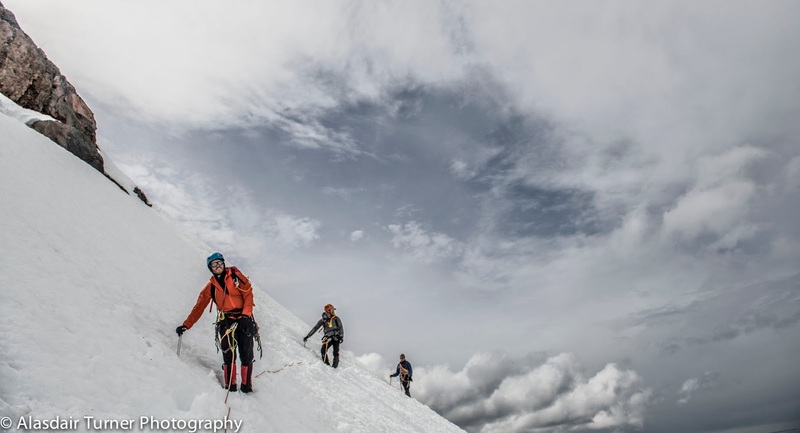 The Alpine Mountaineering and Technical Leadership course at American Alpine Institute is a four part course that covers most aspects of climbing and can take a beginning climber from top roping basic climbs to summiting some of North America's most sought after peaks in under two months. This course was part two of the series where we teach students how to lead safely on alpine rock and ice climbs. These are some of my favorite courses to teach due to the fun objectives we get to climb and it always gives me great photo opportunities. 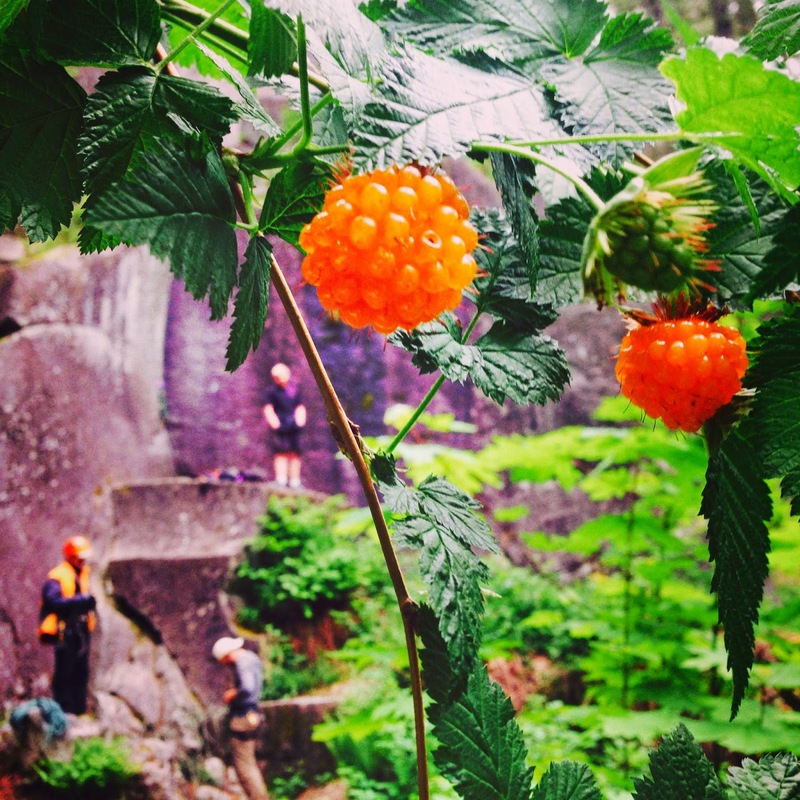 We started the course with four days of rock climbing. 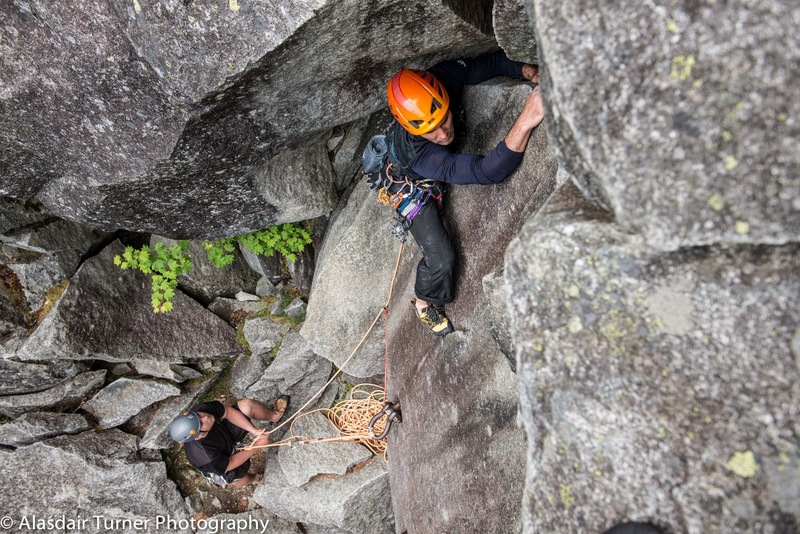 We split our time between Leavenworth and Index, covering the basics of lead climbing, multi pitch anchors and basic rock rescue techniques. On the fifth day we heading into the Colman Glacier on Mount Baker to learn some more advanced glacier travel techniques, crevasse rescue and ice climbing. The first day was amazing and after hiking in we managed to do a very technical tour through part of the Colman Glacier Icefall using good glacier travel techniques. The next day we woke up to rain. Lots and lots of rain. We were able to cover ice climbing, crevasse rescue and ice anchors and then made the call to hike out rather than spend a wet night in the tents. We drove to Mazama to cover alpine rock climbing, but had to start the next day with a little gear drying. 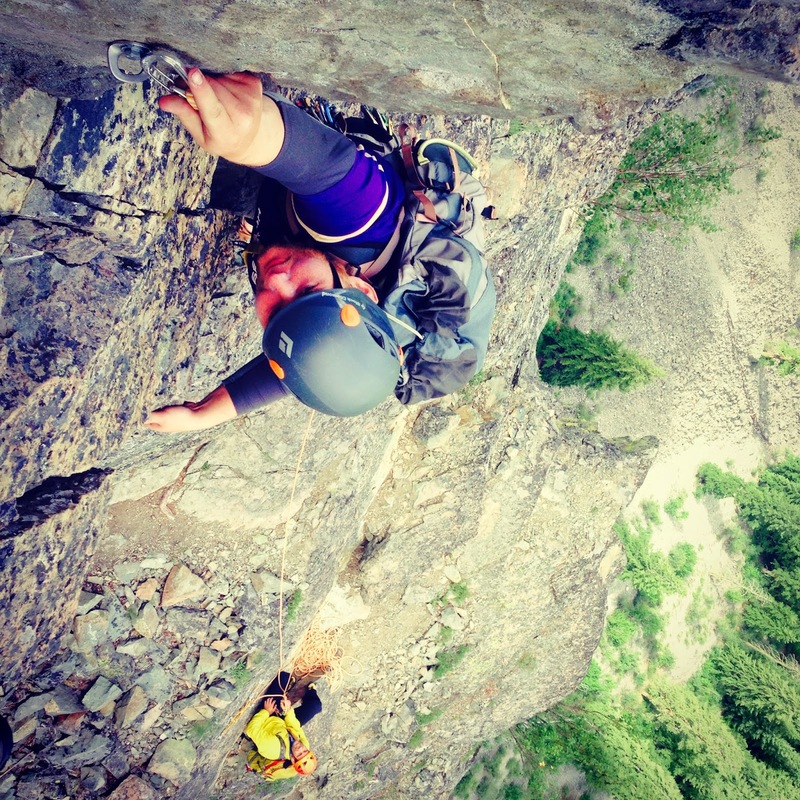 The Washington Pass area contains some of the best alpine rock climbing in Washington and despite a less than perfect weather forecast we managed to get some pretty good climbing done in the area. 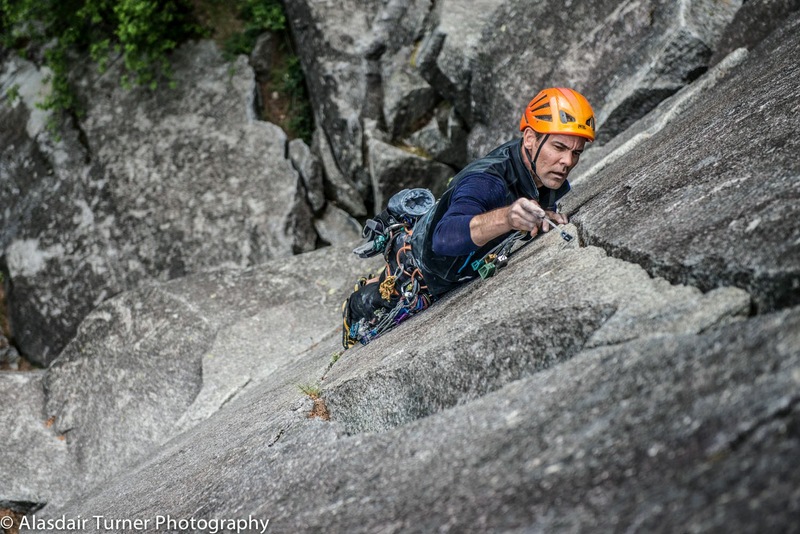 We climbed the classic Beckey Route on Liberty Bell. The following day we climbed the 11 pitch route Prime Rib on Goat Wall and then the amazing 5.8+ SE Rib of South Early Winters Spire the following day. All of these routes were climbed with students leading. Its not often guides get to sit back and climb on top rope all day, but thats exactly what I got to do on Prime Rib. 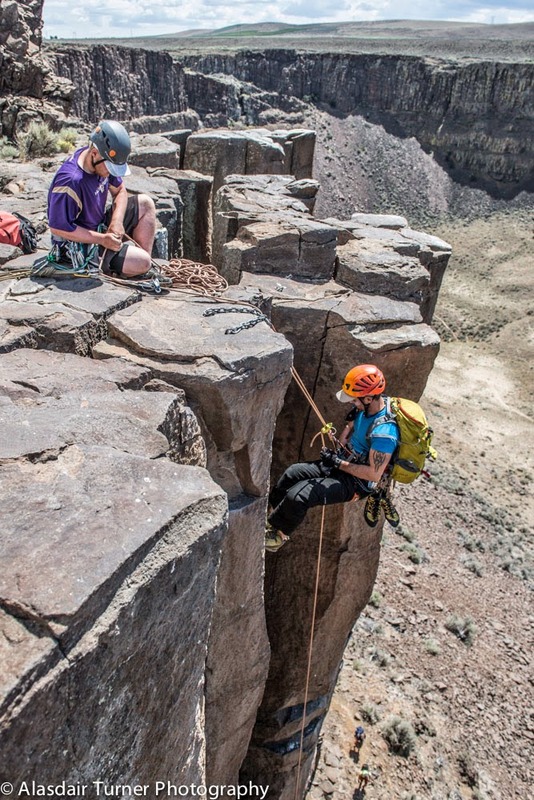 For the final two days of the course the weather dictated our objectives and we ended up in Washington's desert climbing area near the town of Vantage Washington. Here we worked some more of some difficult rappelling problems and lead climbing. Overall this was an amazing 12 days and despite some weather challenges we covered a huge amount of material and climbed a lot of objectives. I look forward to teaching another one of these soon. The roundup of videos this weekend focuses on the idea of the process of climbing. So often we get wrapped up ticking off a summit or a project that we forget about all the fun that goes into getting from Point A to Point B. 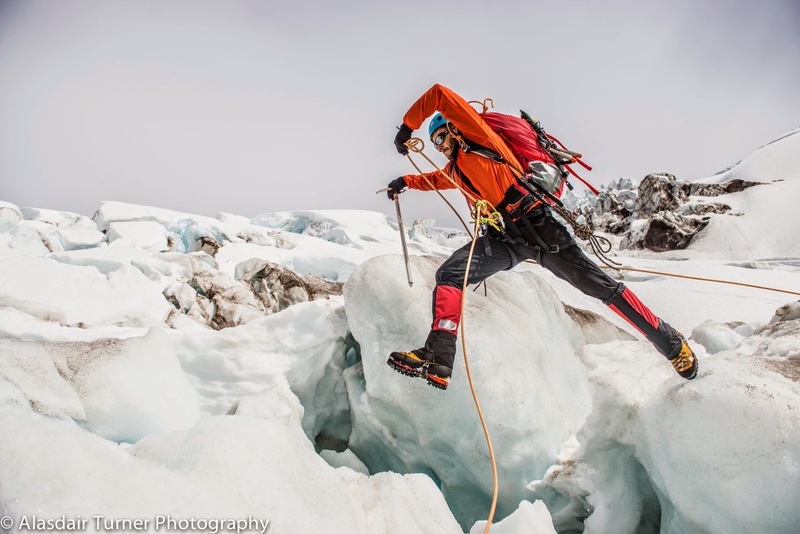 As Ueli Steck says in this first video, "There is no guarantee in getting to the summit, so you really have to love the process. And if you look at it that way, every expedition is successful." Ueli Steck | The Process from Mountain Hardwear on Vimeo. In our next viedo, Sam Elias shows us the amount of effort the he and Walker Emerson put in to establish a new line in Oliana, Span. FYI, it was about 50 man-hours each. For him, it was not just the experience of climbing the route, but sharing the whole experience - start to finish - with someone. 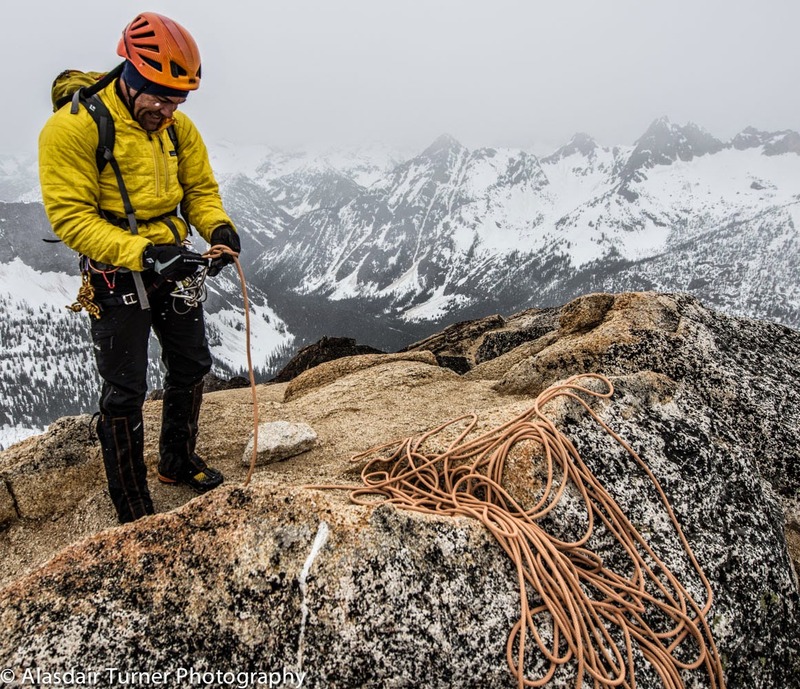 In the last video, Tonde Katiyo and Travis Kemp share the experience of bringing to life an unclimbed boulder in the forests of Index, WA. 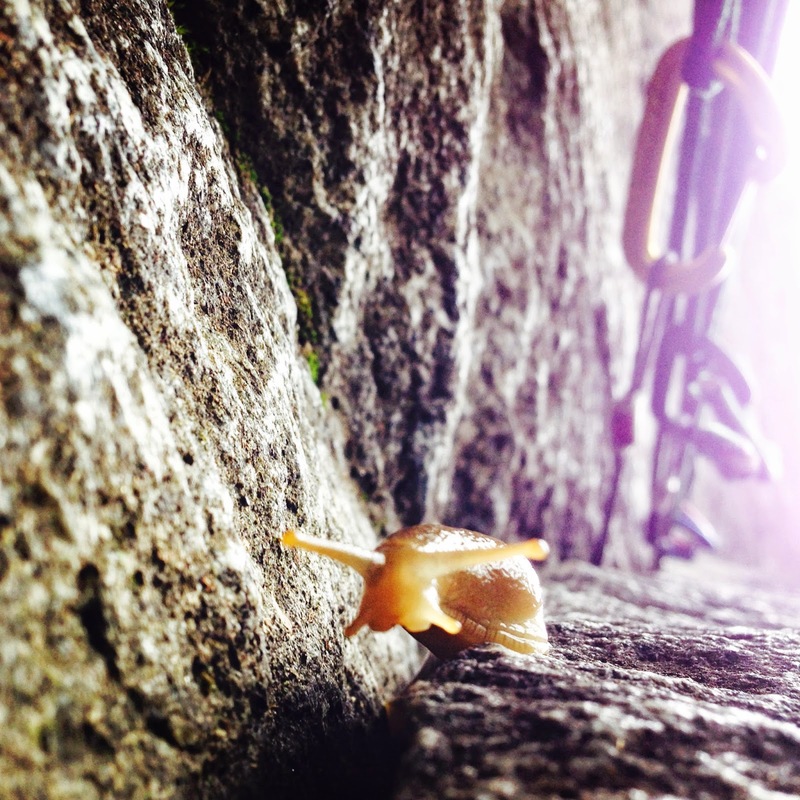 For Tonde, once they got started, he didn't care what the difficulty of the climb ended up being, he was just thrilled to climb the beautiful piece of rock. of the large notch. John Scripps. Rising above Little Lakes Valley in the eastern Sierra, Bear Creek Spire is the most popular climbing peak of the Rock Creek area. 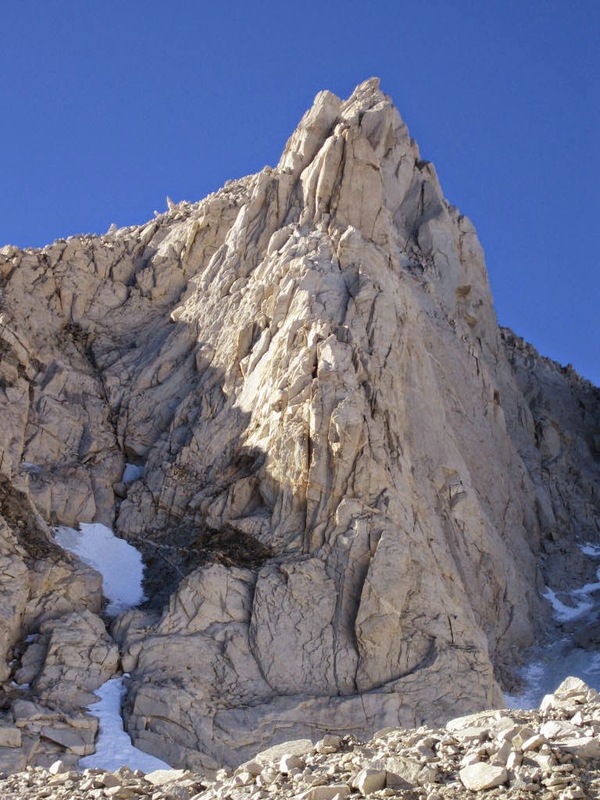 It claims three of the classic High Sierra climbs - the North Arête and the East Arête both weigh in at 5.8, while the less technical but no less aesthetic Northeast Ridge is usually considered 4th class with a few easy class 5 moves. Most climbers consider the North Arête to be the most compelling line of the three. With lots of cracks, some face climbing, stemming, and hand jams, the route contains all the best of a typical Sierra route. View from the Arête, with the approach in the background. are Treasure Lakes. AAI Collection. 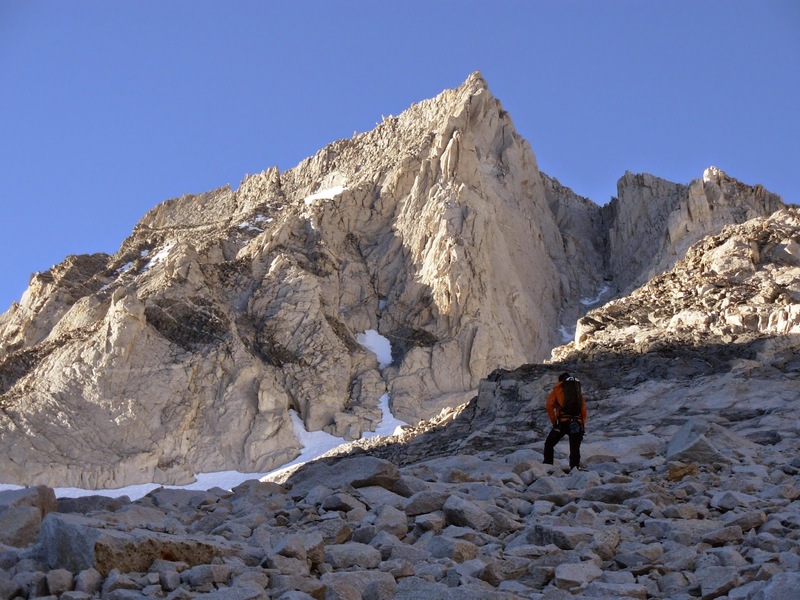 The good news is that the trailhead is at 10,260 feet, the highest access point in the Sierra, making the approach only about 4 hours for most climbers with light packs. (The bad news? It’s called Mosquito Flat - bring your bug spray in summer). Rock Creek Road can be closed as late as June due to snow, so check road conditions before you head out. From the trailhead, follow the Little Lakes Valley trail, which is the remnant old road and has the corresponding gradual grade. After 3.5 miles, you cross a creek. There used to be a wooden footbridge here, which you may read about in old trip reports and the first edition of Supertopo. That footbridge no longer exists, but you’ll see a signed and well-worn climber’s trail to Gem Lakes. Camping is possible at Gem Lakes, but most climbers push through to Dade Lake, which can be reached by climbing up and to the left across (sometimes large) talus from Gem Lakes. Dade Lake is more exposed to weather and lightning, but has a better view of the route and is also the last water on the approach. The area has lots of bear activity, so bear canisters are required. From Dade Lake, it takes about 1-2 hours to get to the base of the route. As a north-facing route, the North Arête doesn’t get much sun, so bring your layers. Depending on season and snow, an ice axe and crampons may be necessary - you’ll be able to tell from the approach to Dade. of the large flake above the first ledge. Graham Hamby. The route itself is a Sierra classic, with five or six pitches of great climbing followed by a long aesthetic section on a low 5th-class ridge. 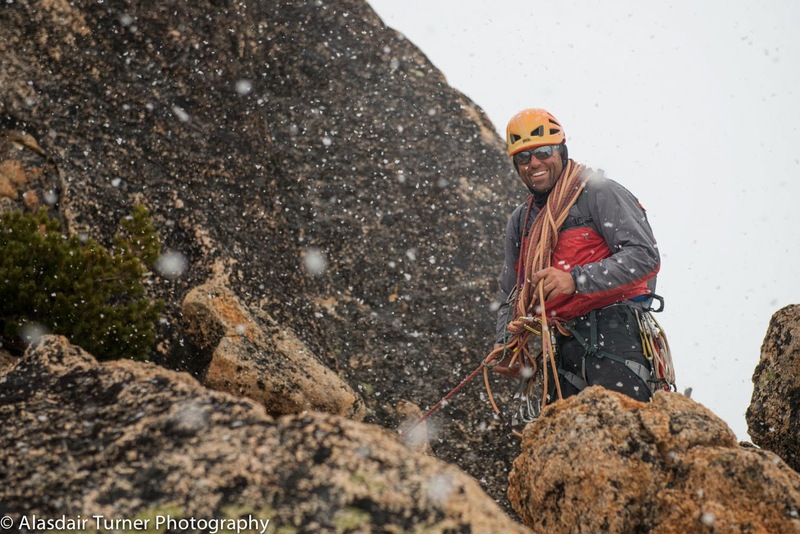 The first pitch involves a fun 5.7 crack, followed by some 5.7 flakes - but watch these flakes, as they may be expanding. Pitches 3 and 4 are a bit easier, generally 4th class or low 5th. The crux of the route is a series of steep 5.8 flakes in a chimney - the flakes can be awkward, so climbers tend to use the technique that feels right to them, whether that’s using some offwidth technique, chimneying between flakes, or stemming. 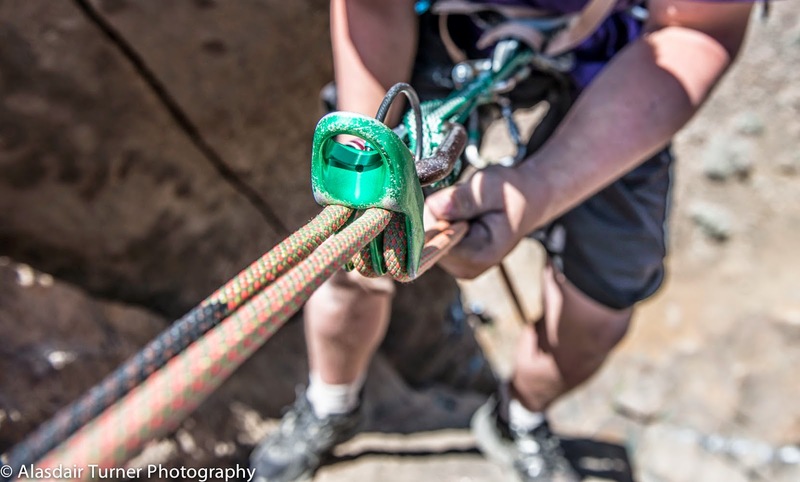 It can be hard with a backpack, and be careful of pulling loose rocks above the crux onto climbers below. The second half of the route involves 4th class climbing on an exposed ridge. The summit block is a 5.6 mantel. Either downclimb the way you came up for use a rap down a 50-100 foot section. The head north to a saddle that looks down on the snowfields in the Dade Lake basin and the rest of the descent back to Dade Lake. The easiest descent begins past the notch, and may require an axe in early season. 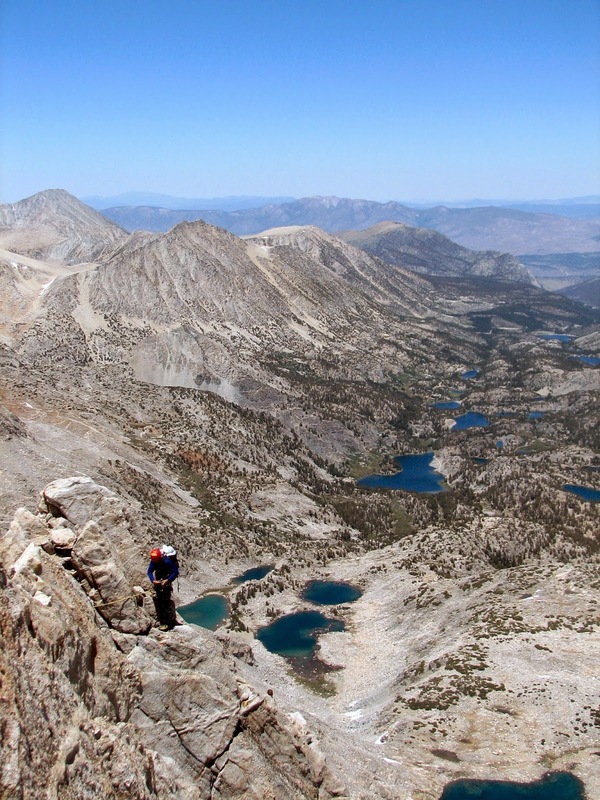 It takes about 3-5 hours to get back to Mosquito Flat from the summit. 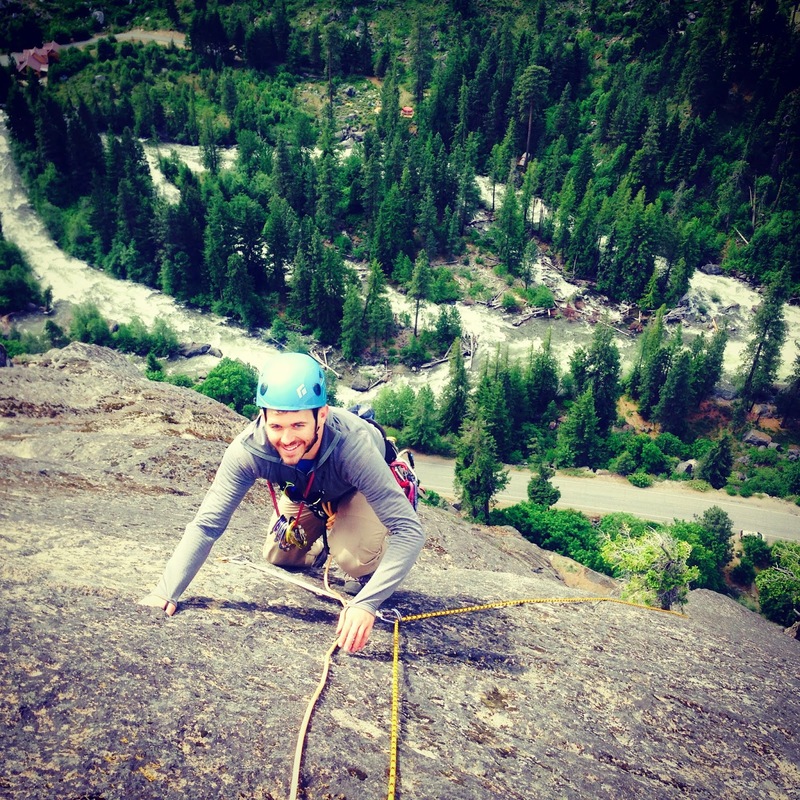 Bear Creek Spire is one of our favorites for two or three-day guided alpine climbing trips. 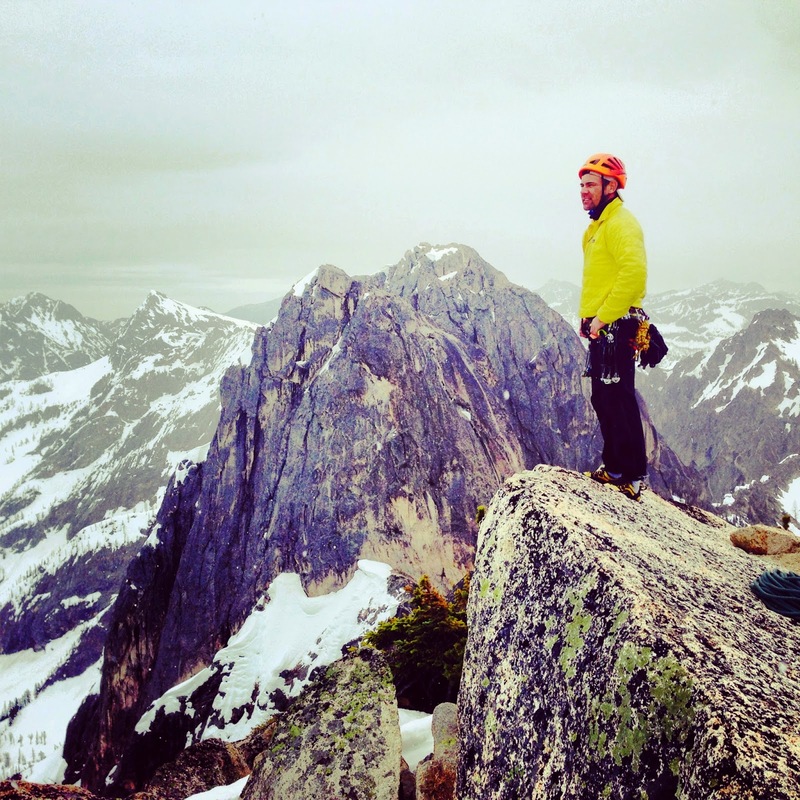 If you are interested in building your alpine rock skills on the North Arête or Northeast Ridge, give us a call at 360-671-1505 or email hillary@alpineinstitute.com to set up a trip! Sit back, relax and feast your eyes on some local sweetness known as Leavenworth. Not only is it home to some of the best roped climbing in the state, it also has some phenomenal bouldering. On top of that, there's also great white-water too if you're into that kind of thing! These climbers get an up-close and personal view of that water on some of the problems in this clip. 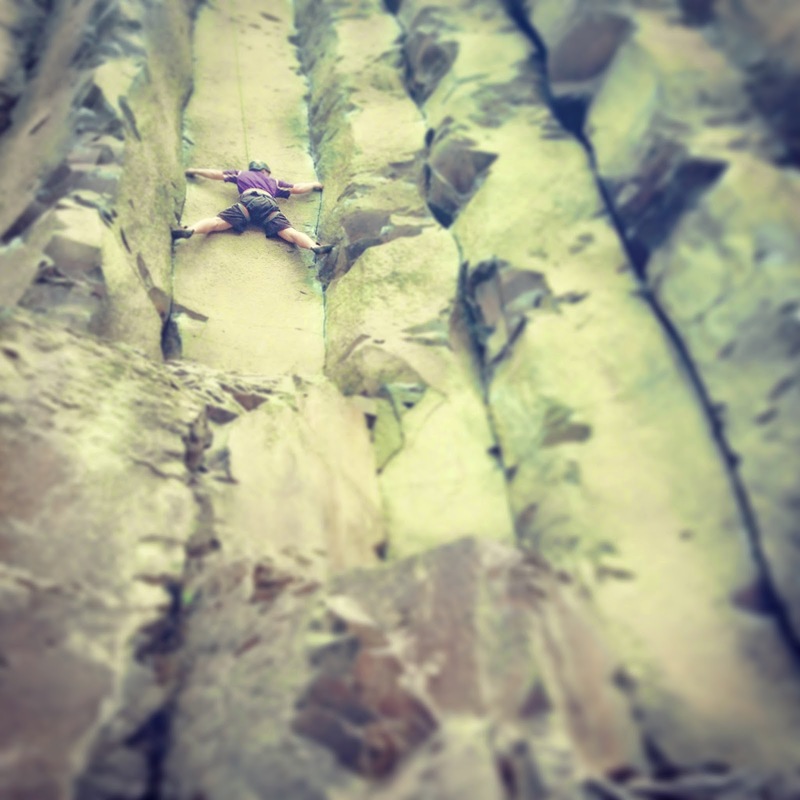 Another great Washington bouldering destination is a bit further east, out by Spokane. This hidden gem called Tumtum looks great as well! 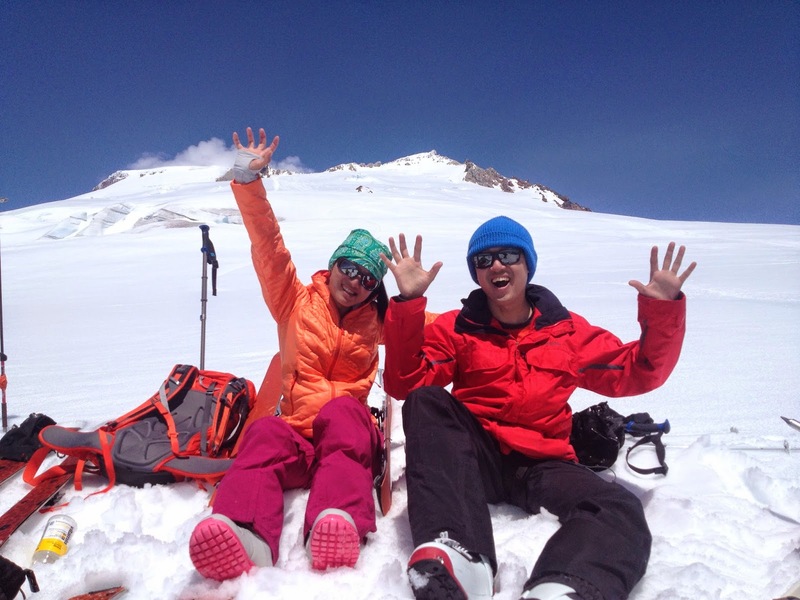 Earlier this year Kun Chen and Bing Gao had the opportunity to work with AAI Guide Ben Gardner on a custom two day Backcountry Skiing program. This was Bing and Kun’s introduction to snow outside the ski area. After two days, they were hooked and wanted more, much more. So much they decided to set their sites on the iconic Mt. Baker as a future ski objective. This past weekend Bin and Kun came back to turn that dream into a reality. They ventured to AAI to try their hands at skiing Mt. Baker. The trip began on Friday morning at the American Alpine Institute world headquarters in Bellingham, WA. 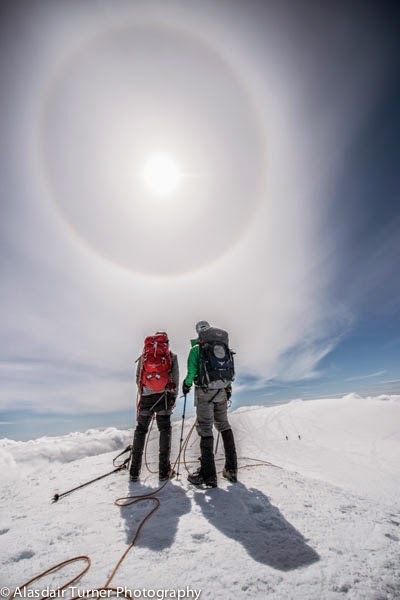 A ski mountaineering trip involves a little more gear than a typical mountaineering trip. In addition to all the general mountaineering gear required for a three day overnight on Mt. Baker, some additional special equipment is needed. o Bing rented a Voile splitboard from the AAI gear shop. This board breaks into two “skis” for uphill tour ability and then snap together for downhill snowboarding. 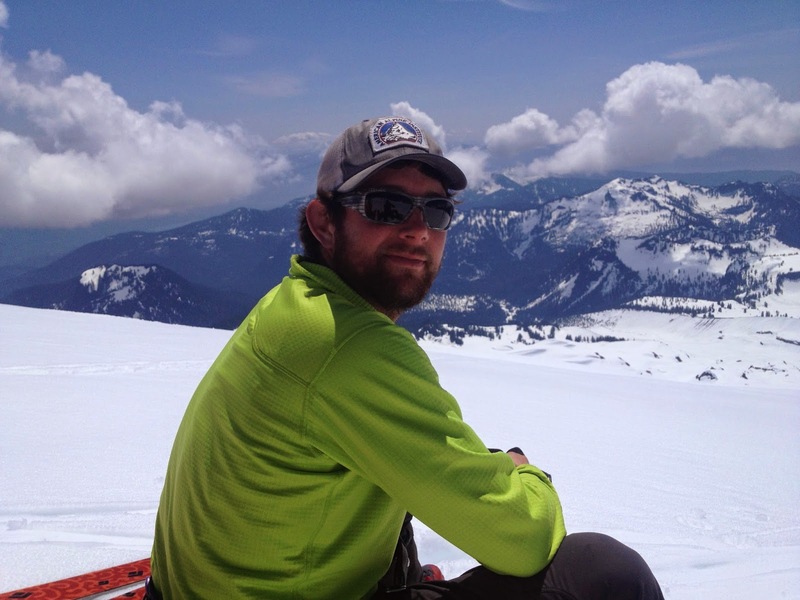 It’s a pretty awesome system that allows snowboarders easier access into the backcountry. After the gear check and prep was done we headed to the south side of Mt. Baker and the Easton Glacier. Right out of the gate, skiing in to camp is significantly more efficient than walking. By utilizing a kick and glide technique, we are almost skiing up hill to camp! It took approximately four hours to reach our Sandy Camp at the base of the Easton Glacier. Choosing a lower camp does lengthen our summit day. However, it shortens the distance that we have to tour uphill with a full pack, and lengthens the distance of the down hill ski. Both big plusses in our book! Day two was spent working on both basic snow school as well as getting some laps of skiing in. The warm temps made for wonderful spring skiing conditions. 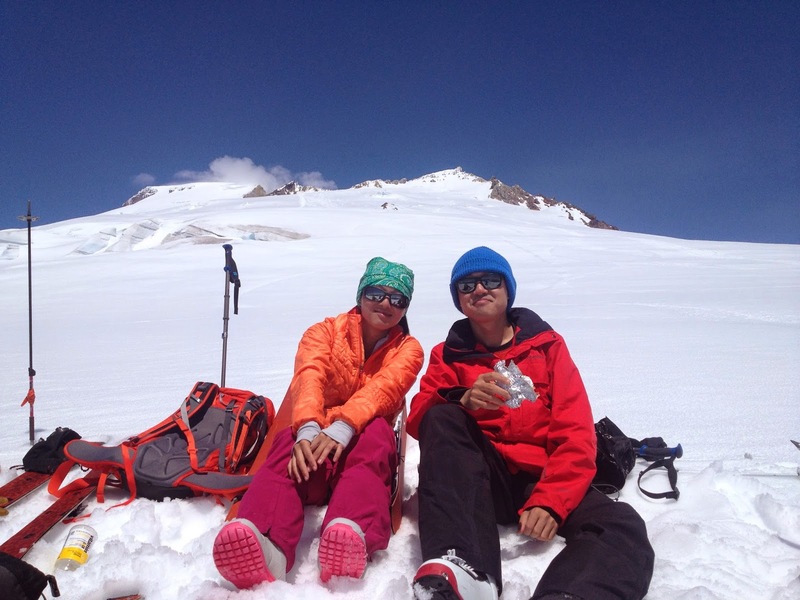 Bing and Kun were ready to call it quits with just one lap, but the awesome snow convinced them two laps would be more appropriate. After the second lap and roughly 3000 feet of skiing we headed back to camp for an afternoon nap and relaxation. We did not want to burn out our legs the afternoon before our summit attempt. Day three began early. Part of the challenge of spring skiing is timing. We need to time the ascent in order to have the best possible conditions for the descent. If we leave camp to early, and then summit to early the upper slopes of the Roman Wall will still be very icy and hard to ski. The Roman wall is around 40 degrees in steepness and icy conditions above crevasses are not what we want to deal with. If we leave to late, the upper slopes will be soft (or too soft) and it will be like skiing through heavy/ sticky mashed potatoes. One of my jobs as a guide (in addition to risk management) is figuring out that time window when the snow will be just right. We woke early at 03:05 AM and were out of camp by 04:50 AM. We took our time on the way, taking 4 or 5breaks on the way to the summit, including one break in the crater which was pretty awesome. The smell of sulfur and lure of the top encouraged us to make this break a short one. One more stretch and we were on top. Conditions up top were standard for the Northwest. Kind of cloudy, windy, and not great. After a few hero pictures we began to get ready for the descent. We ripped our hides (ski talk for removing the skins we utilize on the bottoms of our skis for uphill travel) and locked in for the descent. Once we began the ski, conditions cleared up. We had timed it perfectly! After roughly 1000 ft of steep (read – controlled) skiing on the Roman wall, we were able to open it up a little bit for the ski back to camp. Conditions were SPECTACULAR! All in all, summit to camp we had a fabulous 4,831 feet (give or take a few feet) of awesome spring skiing. Once at camp we spent an hour packing up and getting ready for the remaining 2,850 ft of skiing to the van. At AAI learning is paramount. 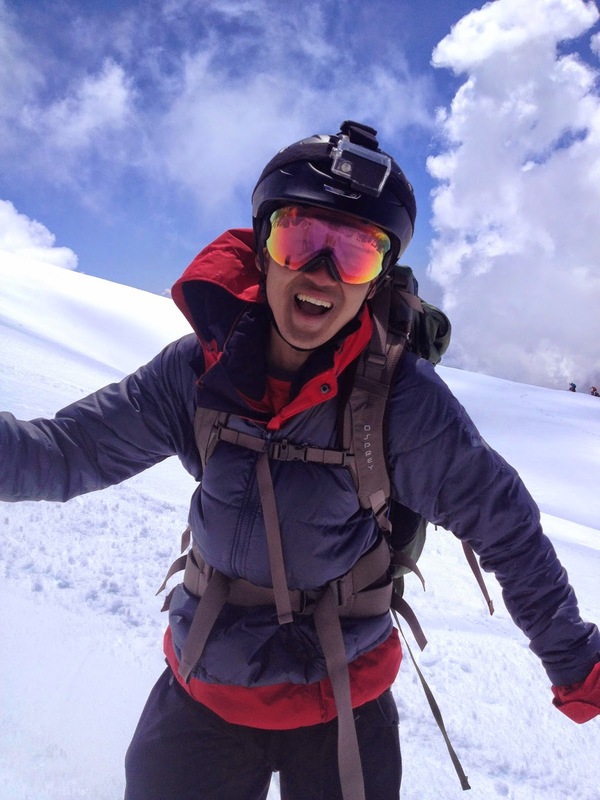 On this trip AAI Guide Kai came along as a shadow guide to learn more about ski guiding. Day two consisted of getting some laps of skiing in on the lower glacier. It was very very serious. Bing in the orange and Kun in the red at one of our breaks on the way to the summit. Kun in the black and Bing in the orange on top of Mt. Baker. Bing SO pyched after skiing the Roman Wall on the upper slopes of Mt. Baker. The Roman Wall is a classic ski descent that provides steep skiing. This is a great introduction to ski mountaineering route. Kun is psyched! Because it was AWESOME! If pictures say a thousand words, than what do videos say? They say it was AWESOME!